Ritual has always been very important throughout human history and always was very important to Layne Redmond. Thus at all our workshops with Layne, there was a designated spiritual focus area. Sometimes it was on the floor in the centre of our circle. At other times, a table stoodexpectantly nearby. Sometimes there was an area set aside for ritual purposes; sometimes there were more. Each drummer was invited to pray or do what is faithful for them there. OftenLayne would invite participants to bring and prayerfully place on the worship centre something of spiritual significance to them personally. Choosing and placing your personal object while all the others watched was a humbling, deeply moving moment. Holy place. Holy time. Sacred living. Above is a small table set on the deck. We were invited to think of how important water is for us. And below this table, was a bowl of shells and stones from the seashore for each of us to take home as a tangible sign of the Holy One whom we found there. During the ritual at this table, the candle was lit. At the indicated moment, each participant put a couple spoonfuls of soil, from a place of spiritual significance to them, into the circular glass vase. We meditated quietly as air bubbled up the tall glass vase of water. Prayer and readings were intermingled. Each time we pick up our drum, it is potentially a power-filled holy moment. Pause to wonder: what am I really picking up? Who accompanies me as I pick up my drum? Whisper a prayer of gratitude: "Thank-you, Source of all." Or read a prayer you like. Each time we set our drum down or put it in its case, what are we doing? What all are we really laying aside in this moment? Who accompanies us? How grateful are we to have had a moment to drum and for the privilege of experiencing God's Pulse within us ? A breathe prayer of thanks is so appropriate as you tuck your drum away. Perhaps someone you know is dying and so you drum Omalu in your home to be with that person and ease their transition from one reality to another. Perhaps a woman you know is giving birth and so you drum Happiness (slowly) in your home for her, for her strength and well-being flowing. And you visualize that new life squeezing through the birth canal and drum a blessing upon the newborn. Sometimes, a Layne event involved going outdoors and lighting a fire to burn our guilt or fear. Can you see the contemporary sistrum? Or we may repeat a particular phrase meaningful to us over and over again, such as 'Loving Creator,' to simply be with God. Or we repeat a favourite prayer or chant a simple hymn like "Be still and know that I am am God" as we drum. This is meditative prayer. God already knows what we need and we know we need to be closer to God. Yet another way in which Biblical drumming becomes prayer is what some call 'contemplative' prayer. A pattern we know well is simply played over and over, slowly and gently. Our worries and concerns start to fade. The pattern quietly leads us to Holy Wisdom who is within us, or to the Light of Jesus Christ or to the Creator, or, or, or. Once in that space, we simply drum andbe there. And sometimes, wepick up our drum and let it play us, knowing we are with God and in God and so feel that Love. No words, just the Pulse of All. That is contemplative prayer, too. Perhaps someone you know is dying and so you drum Omalu in your home to be with that person and ease their transition from one reality to another. Perhaps a woman you know is giving birth and so you drum Happiness (slowly) in your home for her, for her strength and well-being flowing. And you visualizethat new life squeezing through the birth canal and drum a blessing upon the newborn. Each of us is one of a kind! Each of us is a unique expression of our Creator. Thus, we pray best in our own, unique way, as does each drum group. And we have personal concerns, just as we have our preferred drum patterns on ourtambourine and tar. Go with those patterns! Keep going with those patterns as long as they 'work' for you. And when the pattern shifts, go with the shift. Go! And go again! Further guidelines follow below, suitable for copying and printing out for yourself. 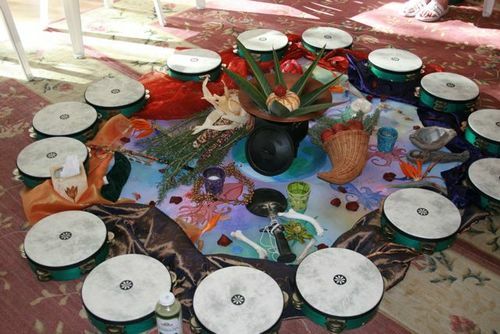 So when you are part of drumming as a group, speak up for a regular 'spiritual' moment as part of your times together. Such a moment out of your drum time is not an add-on, but the very heart and foundation of what and why and how you and I drum. Joyce was 86 when she began to drum. It quickly became part of her prayer life. During the summers, she drums by the hour on her dock or cottage steps sending God's gentle heart beat out across the lake. From time to time, canoeistsmention to her how they can hear it and appreciate it. Kathleen and Mary Ann experiencing the deep joy of drumming out of doors near Bracebridge. 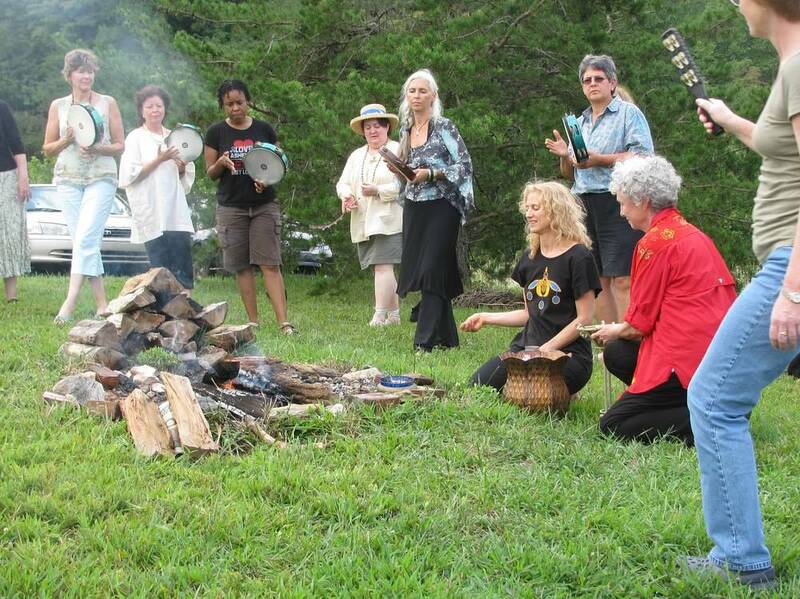 Outdoors, a frame drum with jingles invokes a prayer time for Sylvia. f. to rest in God’s strength/peace/wisdom, etc." * Begin any pattern you know by heart or just play. * Drum slowly, quietly –for a what feels like a long time. let your drumming become loud/strong/fast as you need it to be. * Drum until your drumming slows and quiets. * Continue drumming & open yourself to God. the pattern as a whole. you share. For God, each of your strokes and words is precious, cherished. * Drum until you sense “enough,” ending by giving thanks to God. * Relax where you are. Gently return to the present.